After two decades of holding church services in a gymnasium, the St. Elizabeth Seton Parish asked TFA to design a new church and classroom facility on an adjacent site. The new 16,400 square foot church building contains a 500-seat nave, chapel, cry room, offices and Sunday school classrooms. A plaza was created between the new and existing church buildings for outdoor social functions such as weddings. The church was designed to accommodate a modern fan-shaped seating arrangement with curved pews within a very traditional cruciform church floor plan. 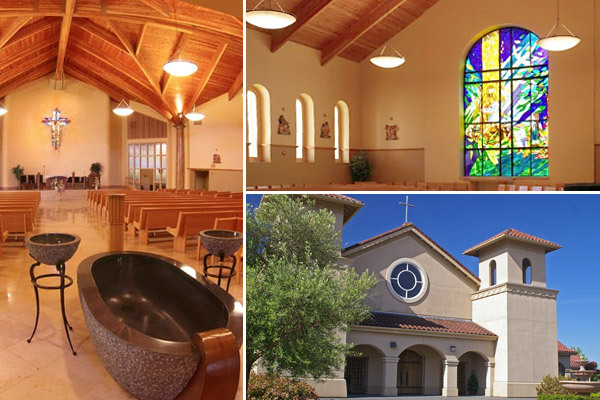 This cruciform plan allowed TFA to create a historically relevant exterior design consisting of mission style architectural elements, including plaster walls, clay tile roof and arched porticos. The interior reflects that style with its columns, thick walls, stone flooring, massive beams and soaring wood ceilings.